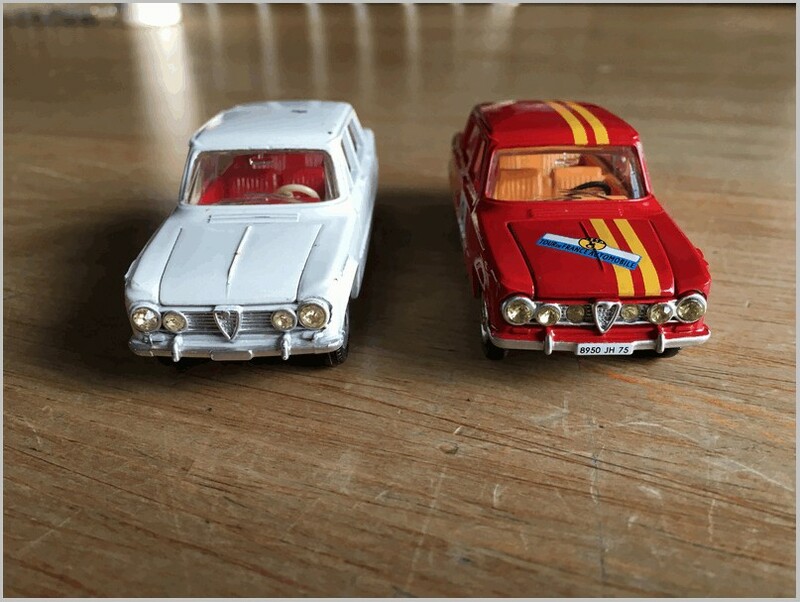 1966 saw a giant in the industry, French Dinky Toys, and a newcomer, Edil Toys of Italy, enter the Giulia TI fray with the best two miniatures in this review. 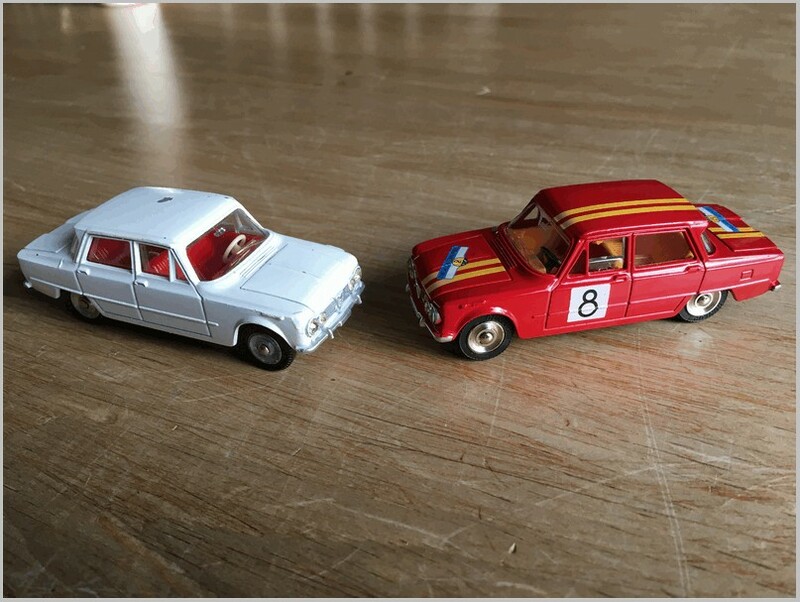 Both were produced to 1:43 scale and both got the complex lines of the car almost perfect, and way better than the competition. 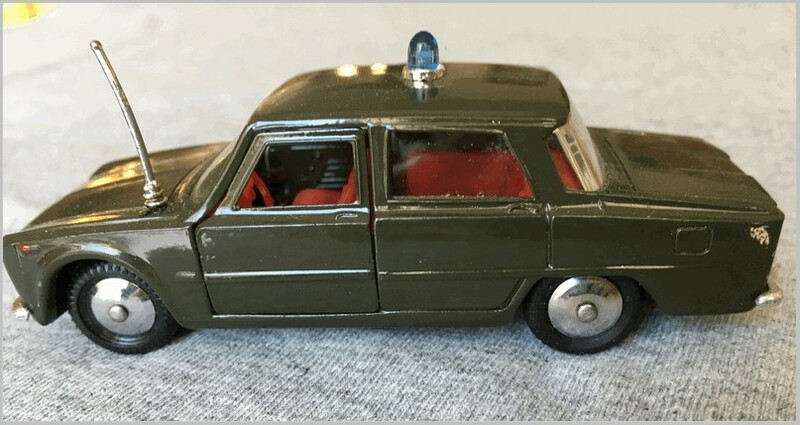 French Dinky is actually the only company that got the most major details correct, by which I mean they included the quarter window frames, which nobody else did. 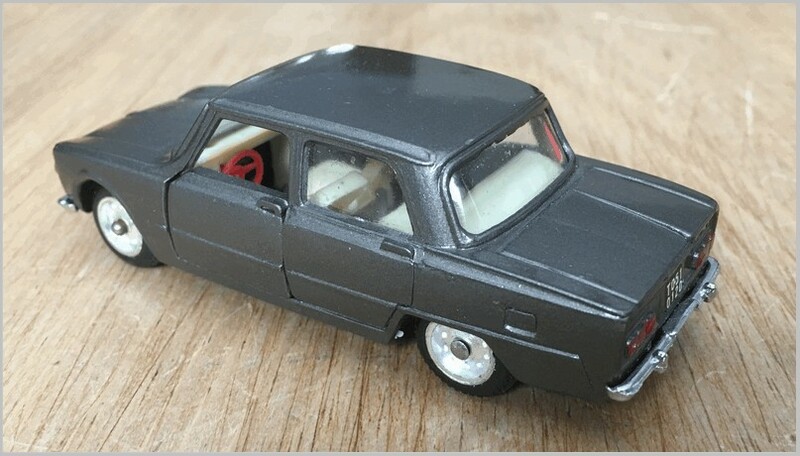 Unfortunately, the only thing that spoils the Dinky is the standard dished wheel, common at the time. However, it features well fitting opening hood and trunk (bonnet/boot), along with driver and passenger side windows that operate. Suspension, the fairy crude but effective Dinky steering, and jeweled headlights/ruby taillights clearly place this model in the late 60s. Bumpers and grill are part of the body casting which has generated some unsightly casting join lines on the body. 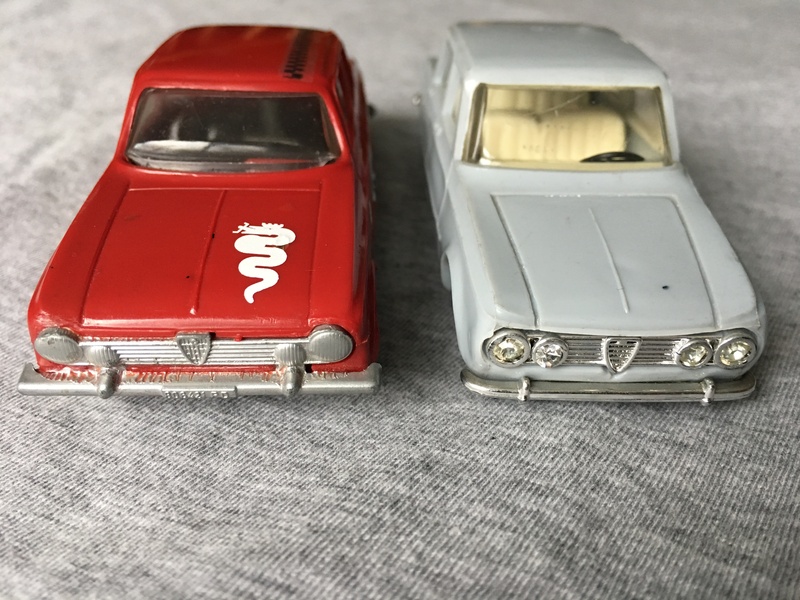 One year later, Dinky released a Rallye version, #1401, in red with period decals, and a casting variation to the front grill, incorporating extra spotlights, also jeweled. Both of these versions have been reproduced accurately in the Atlas Dinky series, nice alternatives to the now very expensive originals. 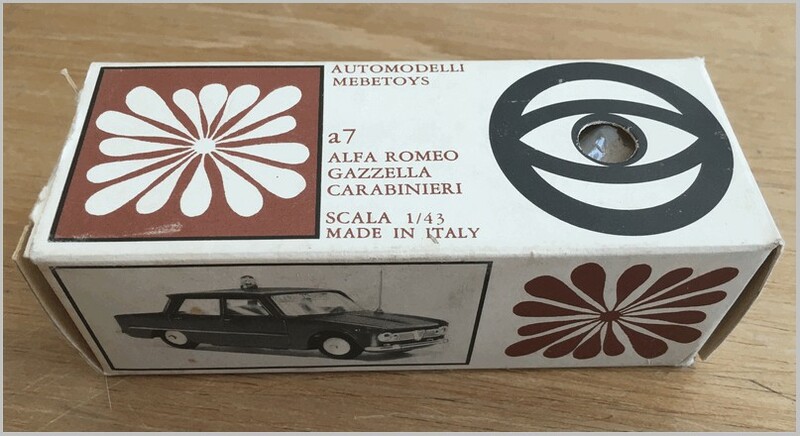 The Edil Toys Giulia Polizia, #5 in this small Italian range, is an absolute gem, with everything opening and accurate wheels (with no axle protrusions on the early versions. 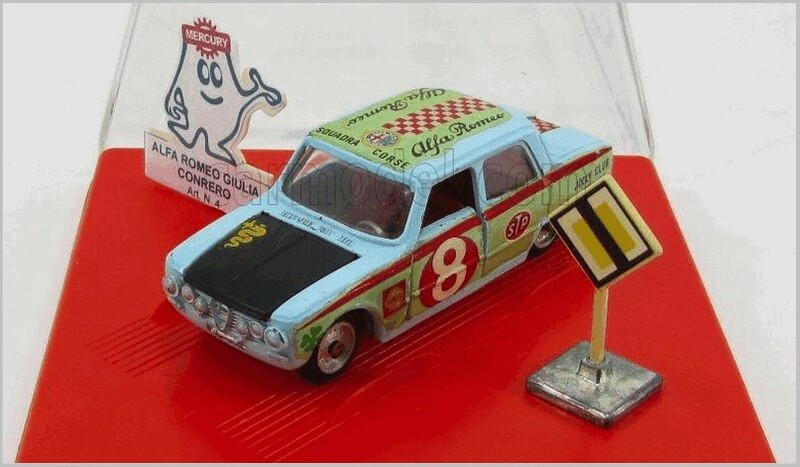 An Italian website shows protruding axles on a later version), only missing the quarter window frames. While most others in this comparison (Politoys and, to come, Mercury) only did “half doors,” Edil modelled the window surrounds. It also features suspension, but no steering. Rear taillights are the most accurate of the lot, if only represented by decals, a point to note when buying online. The engine representation under the bonnet is a separate insert (unlike the Dinky which is part of the body casting), and is done in silver. I can’t really tell is this is plastic or metal, but the fine engine detail makes me lean towards plastic. It is much more detailed than the French Dinky engine representation. Bumpers and grill are separate chromed plastic pieces. Front seat backs also tilt forward, and all four doors have inner door panels in plastic. A note of caution is that the rear plastic inner door panel is part of the door hinge structure, so careful handling is required. If the plastic were to be damaged, the door would not sit correctly. Only the oversize antenna and lack of quarter window frame detract, but the regular sedan, ie, the non-police version (#4), would be close to perfection for its time. The regular Edil sedan came in several colours. Edil’s previous history involved plastic construction buildings, similar to LEGO. Edil jumped into the diecast market at that period when manufacturers were competing with operable features. They clearly had to be special to take on the likes of Mercury, Politoys, and Mebetoys. Hence, everything opened, including all four doors for the appropriate sedans in the range. However, they did not survive, with production ceasing in 1968, and the dies passing to Orfey of Turkey. As is usually the case with second owners of the dies, the Orfeys were a bit cruder, and came with “Whizzwheel” style wheels. Bases were modified, but some apparently still had Made in Italy cast in. Anything Edil is now very difficult to find and expensive to acquire. 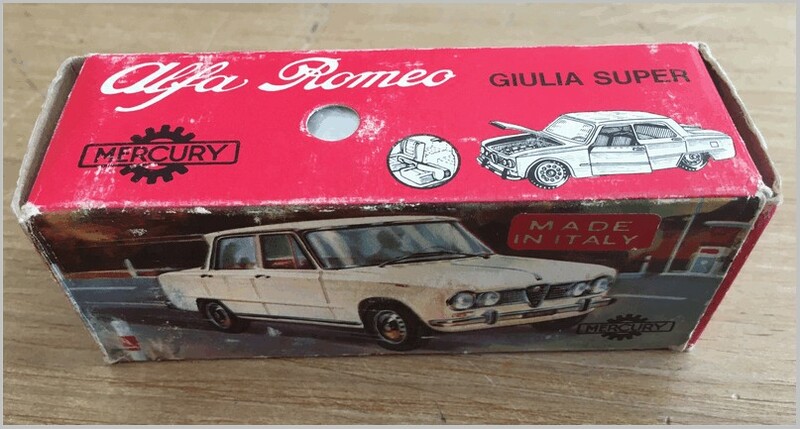 Despite the Orfey Giulia having bad wheels, it is even more difficult to find and more expensive that the original Edil. 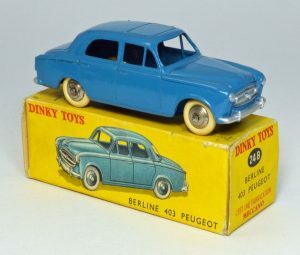 Producing two versions of the same basic automobile was not something that Dinky Toys normally did, but in the 1950’s, the French Meccano factory in Bobigny did just that. 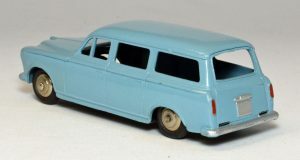 Part of the fabled 24 series of motorcars, the 24B Peugeot 403 Berline was introduced in June of 1956: the sixth new model to be released up to that point that year, followed by the 24F Peugeot 403 Familiale wagon in 1958. 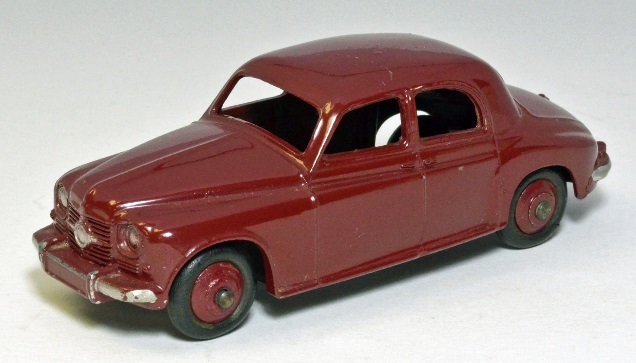 The 403 Berline sedan was a very nicely done model of the real car that incorporated a feature not seen prior to 1956 on Dinky Toys: the appearance of a separate vent window, with a realistic thin vertical piece. This model of an early 403 also did not show the later front indicator lights, as the real car was first built with semaphore signals. This model was first issued in black, followed by blue, then light grey, and yellow. Like other French produced Dinky automobiles in the mid-1950’s, this always came with white tires. There were few changes made along the way, but the early versions did not have the towing eye at the rear of the baseplate, which was added later. Another change was adding clear plastic windows in 1960. 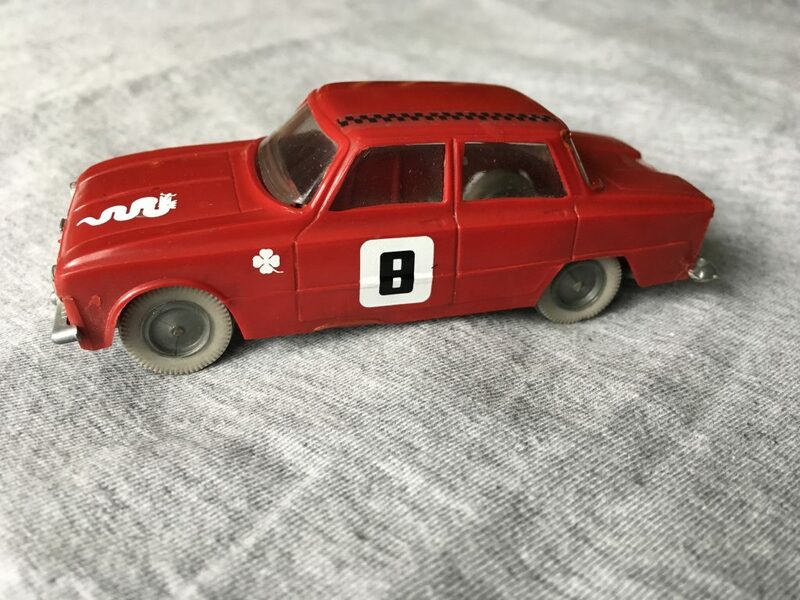 Like all French made Dinky Toys, this one was also re-numbered in 1959, to 521. It was discontinued in 1961. 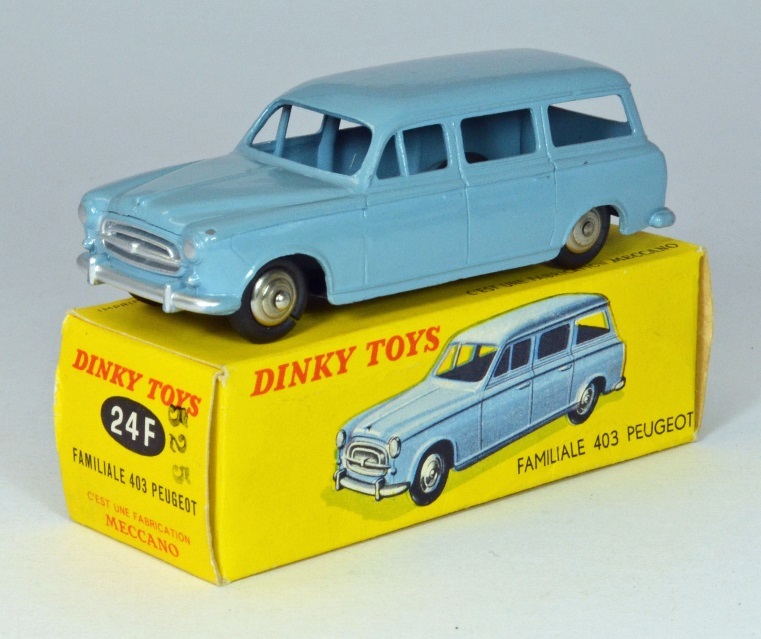 The 24F Peugeot 403 Familiale was introduced by the French Meccano company in 1958, but along with several other new models, it was relegated to the back page of that catalog, and shown in a color never used, black. As usual the French Dinky Toys factory did a masterful job of very faithfully creating an accurate model, and since this was issued a couple of years later then the Berline sedan, it showed the new front indicator lights. As opposed to the Berline, this was always furnished with black tires, and was never issued with plastic windows. The polished wheels were originally convex, then later changed to the concave design. Colors were limited to two choices, a lavender blue or a later grey-blue. 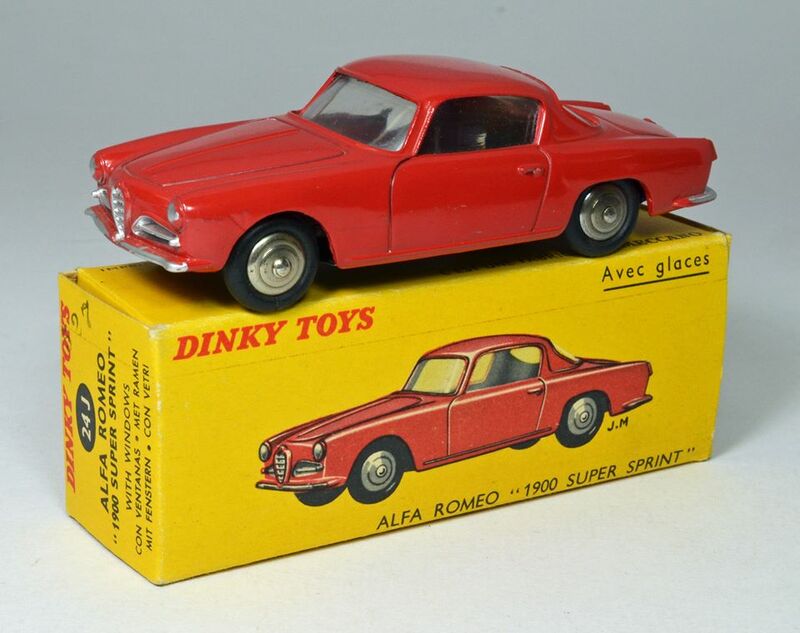 (A very rare, limited production all red version was issued for members of the French Dinky Toys Club.) Like the other French models, this was also re-numbered in 1959 to 525. There were no changes made during its run, which ended with it being discontinued in 1962. The Peugeot 403 made its debut in April, 1955 at a Paris auto show, and was offered for sale shortly after. It was styled by Pininfarina, and was designed with several interesting features: it came standard with a sunroof, the rear doors opened a full 90 degrees, and the rear door windows also fully retracted. The front seats were designed to fully recline, level with the rear seats. The engine was an enlarged version used in the previous 203, and was a 4 cylinder displacing 1.5 liters, developing 65 hp. A short time later a diesel engine was offered as an option, one of the first French cars to do so. A four speed all synchromesh transmission was standard, with an optional automatic clutch offered later. There were three basic body styles offered: the Berline or sedan, the Familiale or station wagon, and a 2 door Cabriolet. The Familiale had a 10” longer wheelbase and had a third row seat installed. The Cabriolet was intended to be a more luxurious, sporty vehicle, and featured an all-leather interior. Its sales price was much higher than the standard 403, so it was discontinued in 1961, and is now quite rare. Many people will remember the American TV series Columbo, where Peter Falk drove one of these, albeit a pretty shabby one. 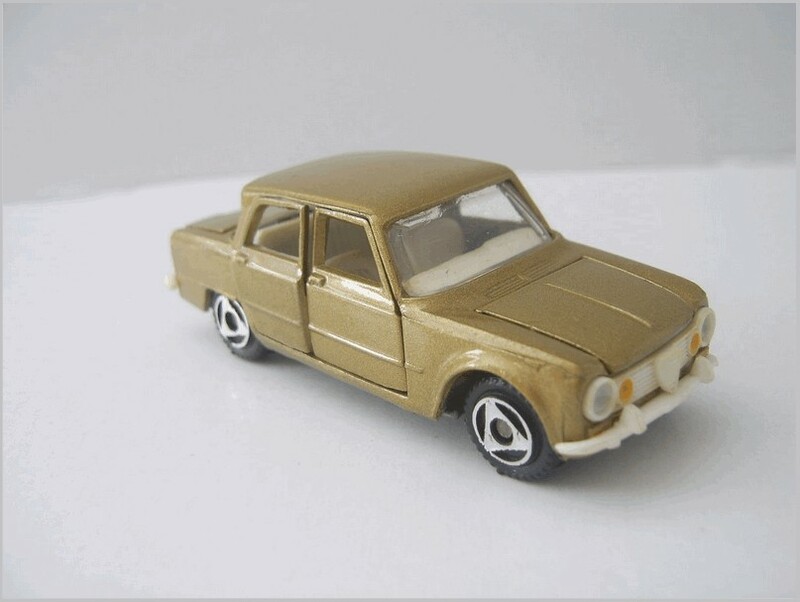 The 403 was produced until 1966, when it was superseded by the new Peugeot 404 model. Counting all models, including some small truck and van versions, a total of 1,214,121 were produced – the first Peugeot to exceed the million mark! 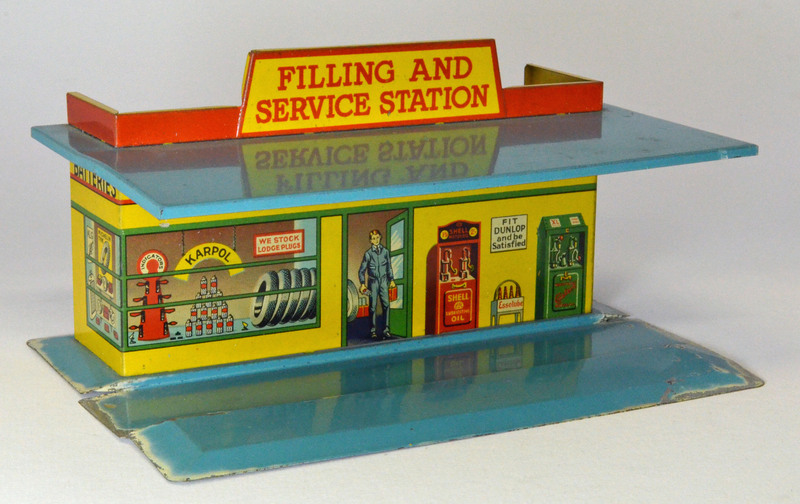 With all toy production halted during World War II, Meccano Ltd. was anxious to start up again, and in early 1946 production resumed, albeit at a fairly low level. 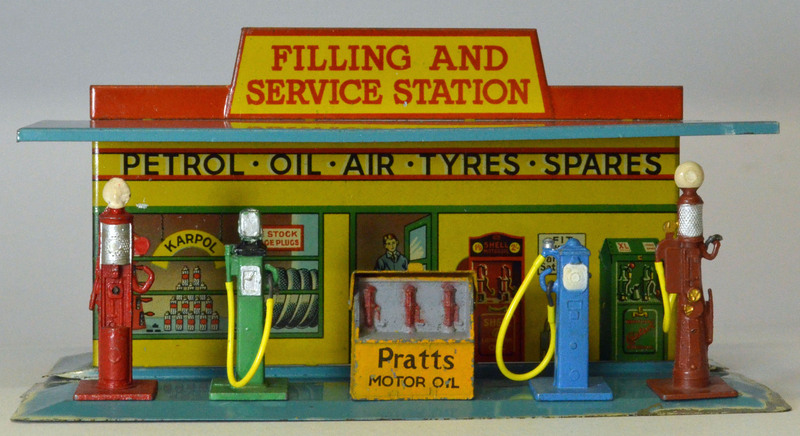 At first, almost all of these Dinky Toys were re-issues of pre-war models that were easy to put into production or use up existing stocks of leftover parts. 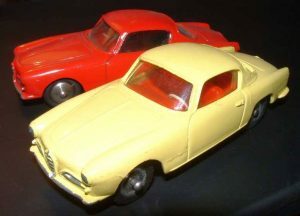 But very quickly, a decision was made to design and build a new series of models, which would feature the latest English production cars, as the automotive industry was also getting back on its feet. 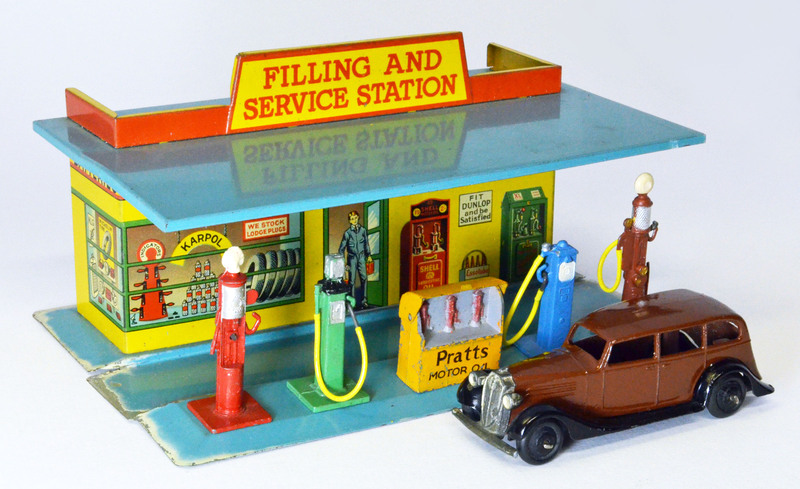 New, modern cars were going to be in demand, and young boys would want the latest Dinky Toys that modeled them. 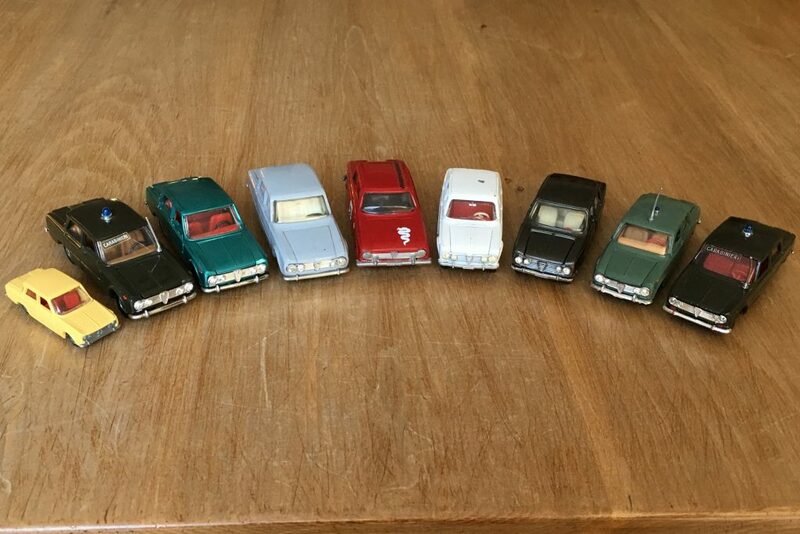 So, starting in 1947, and ending in 1954, ten new models were introduced, which were to prove very popular, and along with new models of American cars, propelled Meccano into it’s best sales years ever by the mid-1950’s. These new models comprised the 40 Series, and along with two other cars labeled 140a and 140b, are the subject of this article. 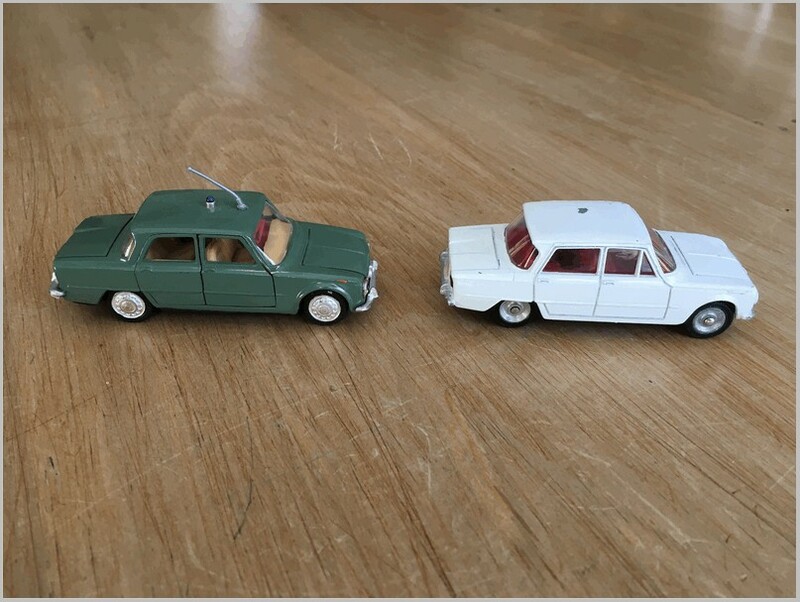 These models were very long lived in the Dinky Toys lineup… they were in production for 7 to 12 years and were arguably one of the most important series of models that Dinky Toys produced. Dinky did a masterful job in modeling each of these to very high standards for that era. 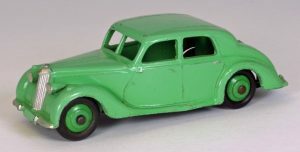 The first 40 series model Dinky Toys introduced, in 1947, was 40a, the Riley Saloon. The real car was a Riley RMA 4-door sedan, which was introduced in 1945 and in production until 1952. This car really retained pre-war styling, and the body was still framed with wood. 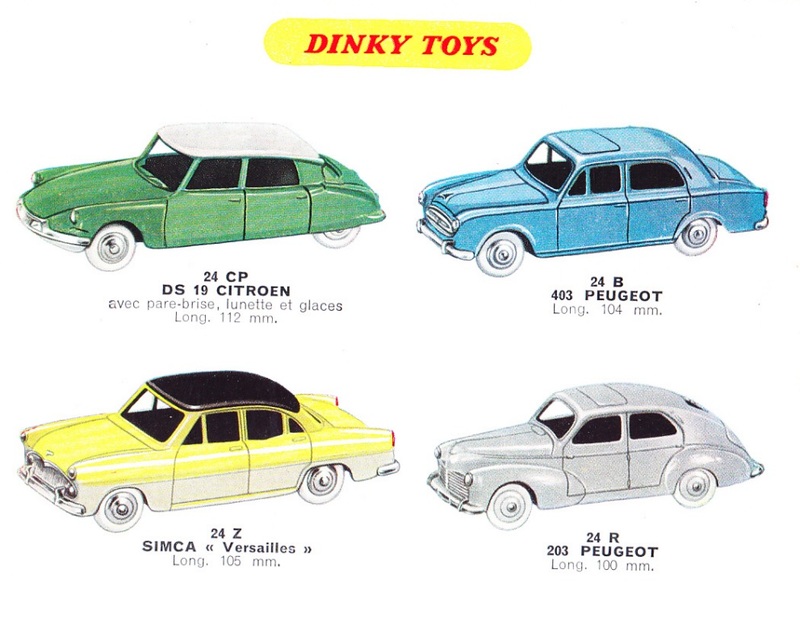 Dinky Toys finished it in several shades of green, grey, or blue, and it was re-numbered in 1954 to 158. Like most of the 40 series of models, it was discontinued in 1960. The next model, introduced in 1948, was 40b, the Triumph 1800 Saloon. The real car was also known as the Renown, and it was introduced in 1946 and was famous for its “razor edge styling”. 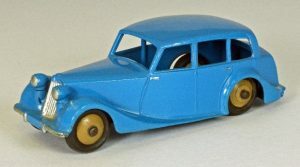 Looking very much like a smaller Bentley, these were comfortable and well built cars, and Dinky was very quick to design and build a model of it. It was offered in grey, black (very rare), fawn, and two shades of blue, and was re-numbered in 1954 to 151. Also in production until 1960. This is my personal favorite of this series of models. Next was 40e, the Standard Vanguard Saloon, also introduced in 1948. This was a model of a brand new car introduced in England in 1947, and it was made in several different versions until 1963. The early Dinky models had open rear wheel arches and a unique rear axle clip. 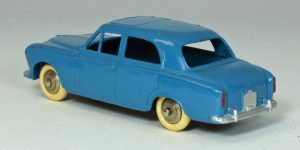 In 1950, the model was changed to show covered spats or wheelcovers at the rear, and the rear axle clip was discontinued. Colors were several shades of tan, two shades of blue, cream, or maroon. In 1954 it was re-numbered to 153, and it remained in production until 1960. Next in line for 1949 was 40d, the Austin Devon Saloon. 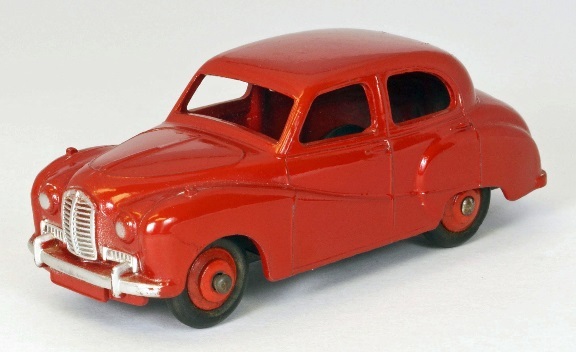 The actual car was called the Austin A-40 Devon and was an all-new design introduced in late 1947. It continued until 1952 when it was replaced by the Somerset model. This Dinky model was also re-numbered in 1954 to 152. Available colors were red, maroon, green, tan, several shades of blue, or a later two tone scheme. Discontinued in 1960. 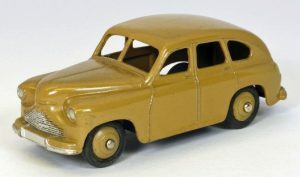 1950 saw the introduction of 40g, the Morris Oxford Saloon. The actual car was called an Oxford Series MO and was in production from 1948 through 1954, when it was replaced by the Oxford Series II. 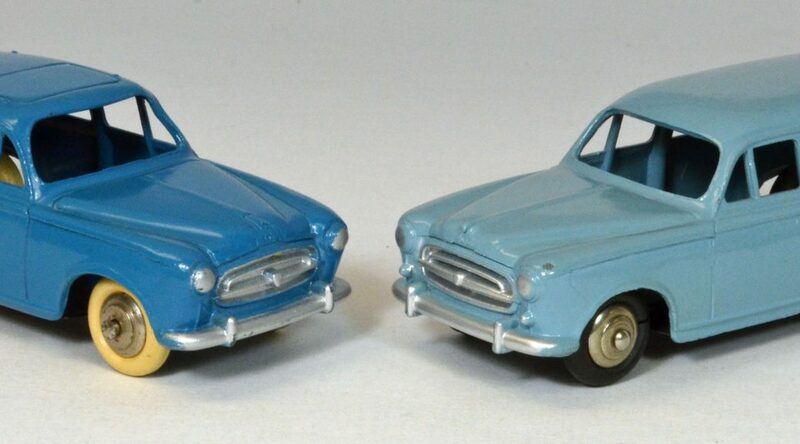 Another Dinky Toys re-numbered in 1954 to 159. 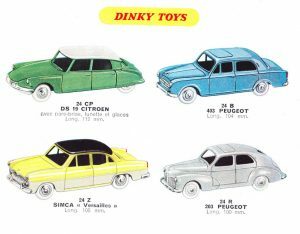 Colors from Dinky were dark green, fawn, grey, light tan, or a later two tone scheme. Discontinued in 1960. 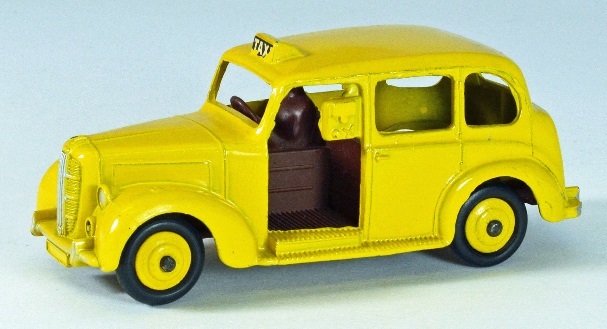 40h, the Austin Taxi, was introduced in 1951. The actual vehicle was named the Austin FX3 Metropolitan Taxi and was first shown in 1948, then produced starting in 1949. It was a very popular taxi in London and was made until 1958, when it was replaced by the FX4. Renumbered in 1954 to 254. Colors from Dinky were dark blue, black, yellow and a later two tone scheme. Discontinued in 1962. 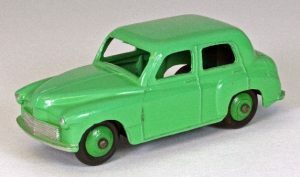 The other model Dinky Toys released in 1951 was 40f, the Hillman Minx Saloon. The actual car, the Hillman Minx Mark IV, was introduced in 1949. Over the subsequent years, several newer versions were built. Renumbered in 1954 to 154. 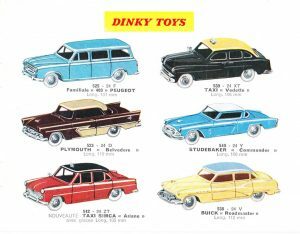 Dinky colors were light or dark tan, pale or dark green, and a later two tone scheme. Discontinued in 1958. The last of the 40 series of saloon cars was 40j, the Austin Somerset Saloon, brought out in 1954. It was quickly re-numbered later in the year to 161. The real car was called the Austin A-40 Somerset and was produced from 1952-1954, when it was replaced by the then new Austin A-40 Cambridge. Colors available from Dinky included red, blue, or a later two tone scheme. Also discontinued in 1960. I have included the next two models, even though they are not technically part of the 40 Series, as shown above. But they were issued at the same time and are also British automobiles of that period, so they rightly belong here. 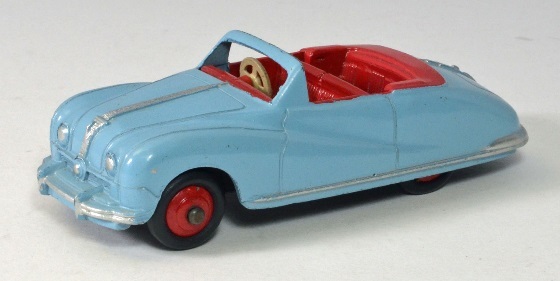 140a, the Austin Atlantic Convertible, was introduced in 1951 and was the first Dinky Toys convertible to feature a fully detailed interior, including a dashboard. 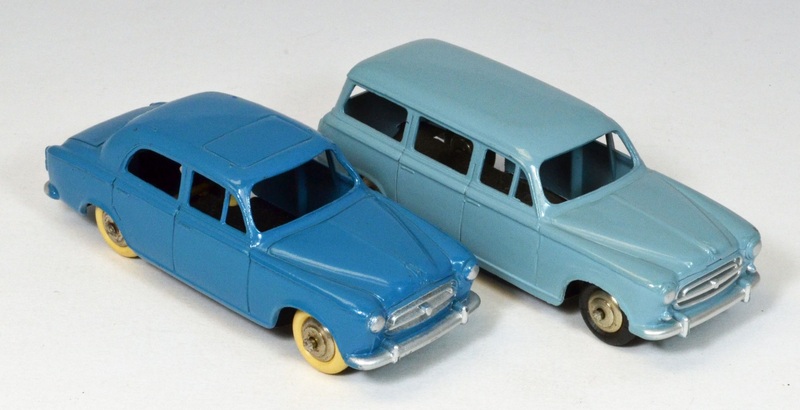 The actual car was labeled the Austin A90 Atlantic and was made in several versions. This was a nice, more sporting car, aimed largely at the US market, but the introduction of the all-new Jaguar XK120 at the same time basically doomed this car to very mediocre sales; it was only made from 1949-1952. Renumbered in 1954 to 106. Dinky Toys produced this in blue, pink, or black, and rare red or medium blue export versions. It was discontinued in 1958. 140b, the Rover 75 Saloon, was also introduced by Dinky Toys in 1951. It was based on the Rover P4 75 model, first shown in late 1949 at the Earl’s Court Motor Show and then available in 1950. It was an upscale automobile, with styling influenced by the early 1950’s Studebaker’s. This version was made until 1954 and was very highly regarded as a quality automobile. Renumbered in 1954 to 156. 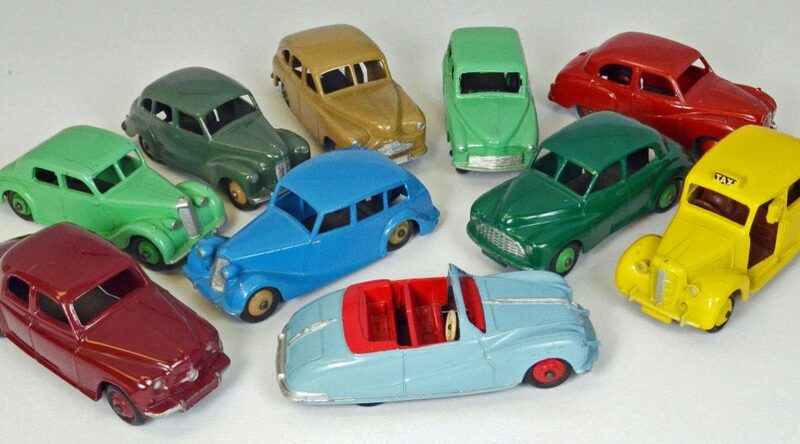 Dinky Toys colors were maroon, cream, or a later two tone scheme. Discontinued in 1958. Footnote: The keen reader will observe that 40c was never issued but was planned to be a Jowett Javelin. 40i was skipped perhaps because it was too similar to the letter j. 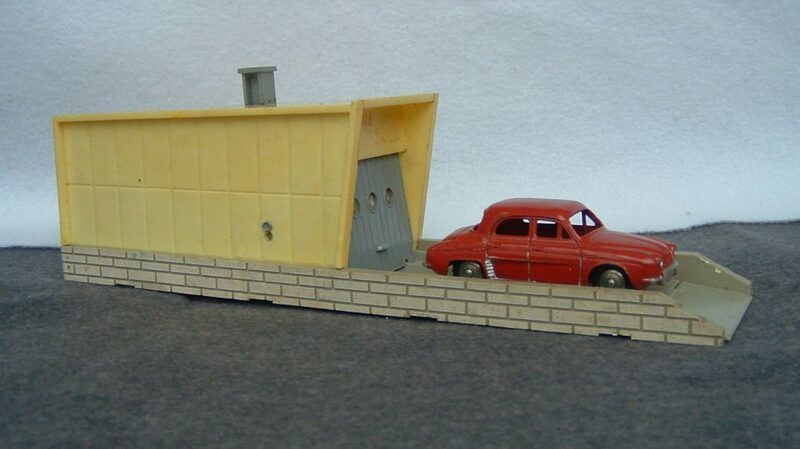 This is another favorite Dinky Toys model of mine, this time made by the French factory from 1952 to 1955. It is the French Ford Refuse Truck, or Trash Truck, number 25v, and features the tilting rear bed, with sliding covers and the opening rear compartment door. In French, it was called the Ford Benne à Ordures. This is another one that I bought directly from H. Hudson Dobson in the US. One of my early Dinky Toy “jewels”… why do I call it a jewel? Because I bought this when I was only about 14, and I was immediately impressed with how solid and impressive it was. This refuse or trash truck is somewhat smaller than the English Bedford version, but, to me, it is just more impressive. It has a rack to raise the rear bed, the sliding covers are a much more precise, and tighter fit, and the dark green finish looks like it was poured on. This was my very first Dinky Toys French commercial vehicle bought in 1959, during a crazy two year stint where I bought dozens and dozens of new Dinky’s. And, after almost 60 years, it is still one of my favorites. 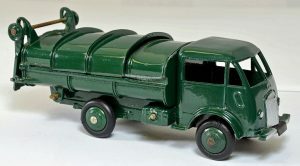 As a young boy, I was immediately struck and impressed with this French Ford trash truck… first, and most noticeable, was the gleaming, mile-deep dark green paint. But I was also impressed with the snug, closely fit sliding doors on the top. Sliding them open, then closed, was amazing; they were so smooth… very different than its English cousin, the Bedford trash truck. Then, there was the tilting mechanism, with a rack and gear operation, that was also so smooth and precise. There was a lot going on, in a fairly small package! Years later, I would aspire to slowly collect the other French Ford trucks, a rather unique set of about 8 different models, with two different wheelbases: a short and a long version. Great little trucks from a bygone era, but this is the one that really caught my attention, so long ago… and it is still almost pristine! 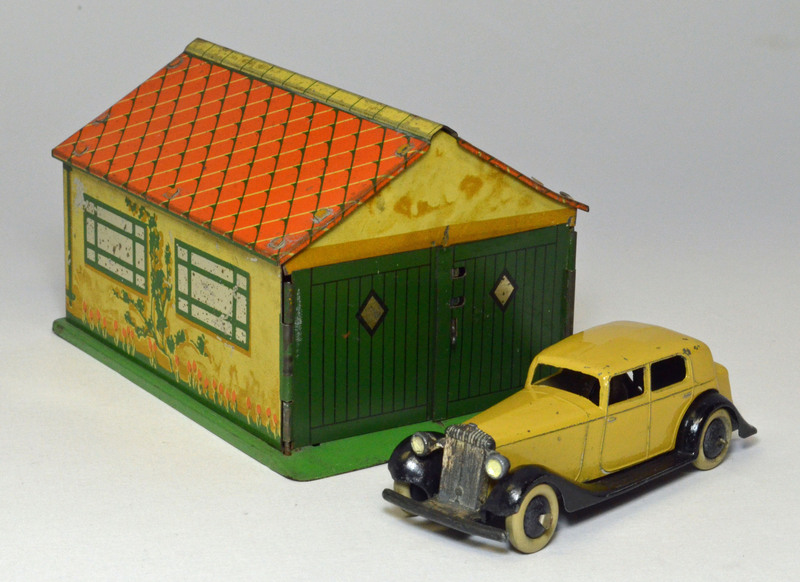 Terry Hardgrave wrote about some very early Dinky Toy garages in November for MAR Online. Here is a later version that has been in my collection since the early 1960s. 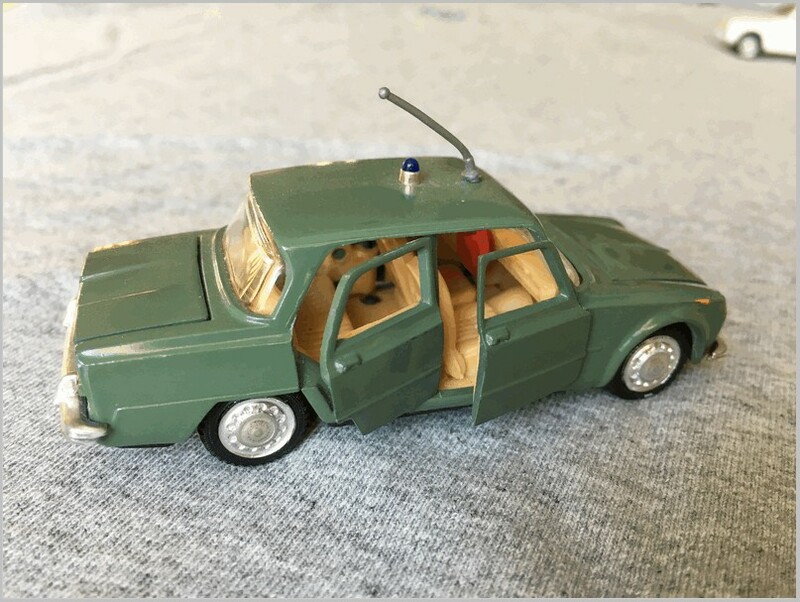 It’s a French Dinky model and is moulded in plastic. 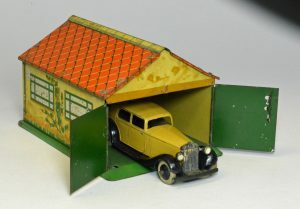 It has an operating feature, when the chimney is pressed down the door opens and the car rolls back into the garage on a tilted driveway. Mine is so old I must figure out how the rubber bands that controlled the door work and fit new ones as the originals have long since perished. It is French Dinky number 502. I even have the box but it is showing some considerable attic storage wear and tear but the $1.25 price tag is still showing! 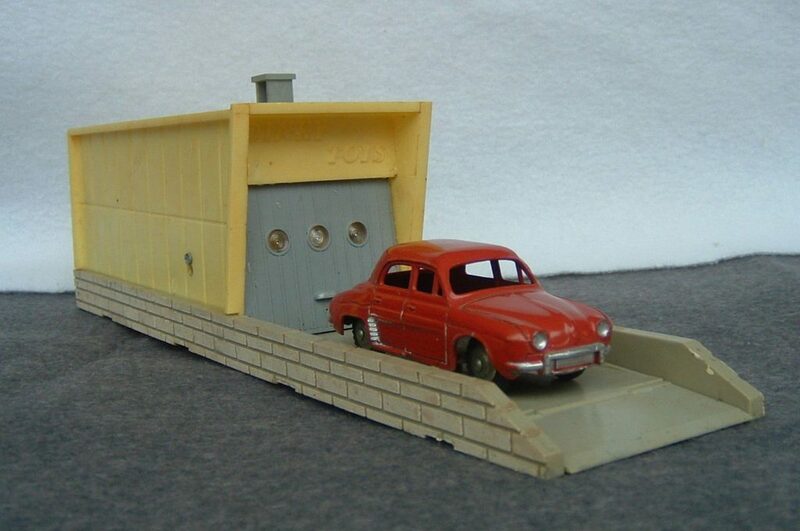 The car is a French Dinky Renault Dauphine number 24E. All text is copyright of the Authors. All photographs are copyright of Terry Hardgrave. 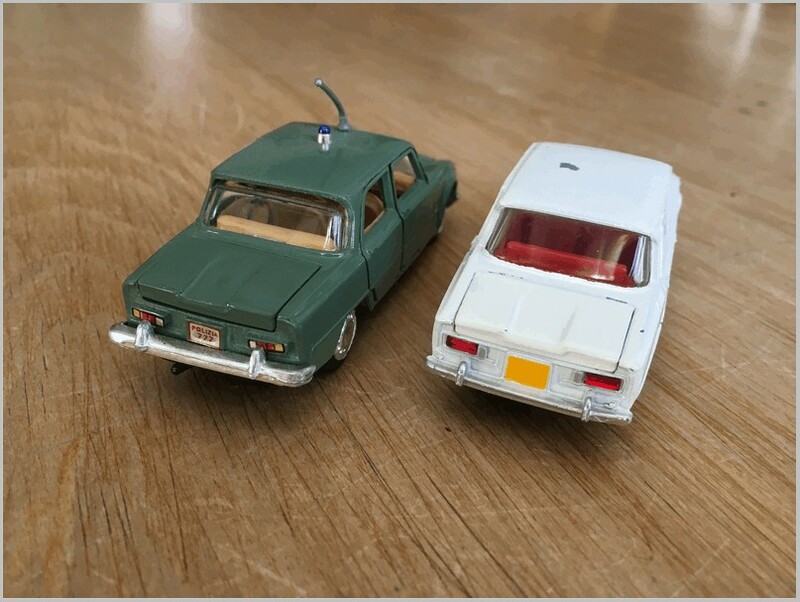 Those two silver record cars are the same vehicle, but Dinky Toys finished them differently over time, one pre-war and one post-war. The car was called the Thunderbolt speed car and was owned and driven by Capt. George Eyston. 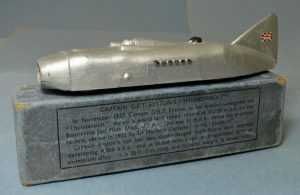 In the late 1930’s it held the land speed record for awhile, at something like 350 mph, before John Cobb surpassed it. The real car was quite interesting: very large and heavy, and quite complex. The men that drove these at Bonneville had to be part crazy! This Dinky is a bit crude, although a fair representation of the real thing. The pre-war version (shown with its box below) was never imported to the US, to my knowledge, so these are fairly rare over here today. 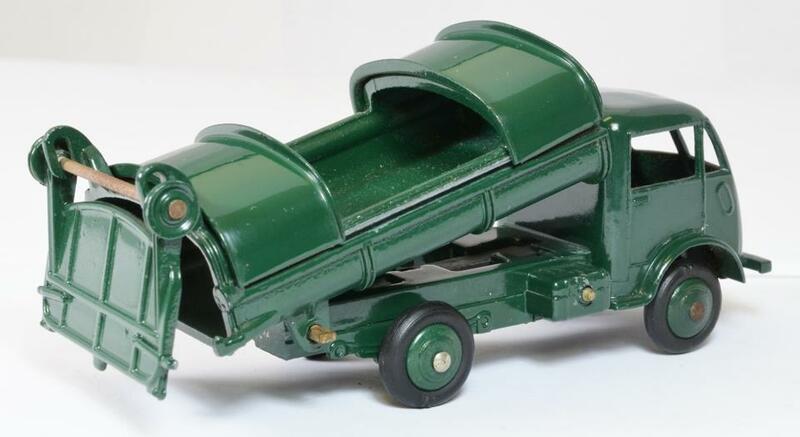 Dinky brought out their first version, number 23m, around 1938, and it was the most accurate. It had black accents and also had a Union Jack flag painted on the tail fin. The 23m was only made in this color combination. This version was made pre-war; Mike and Sue Richardson (1981) report it was made 1938-41. 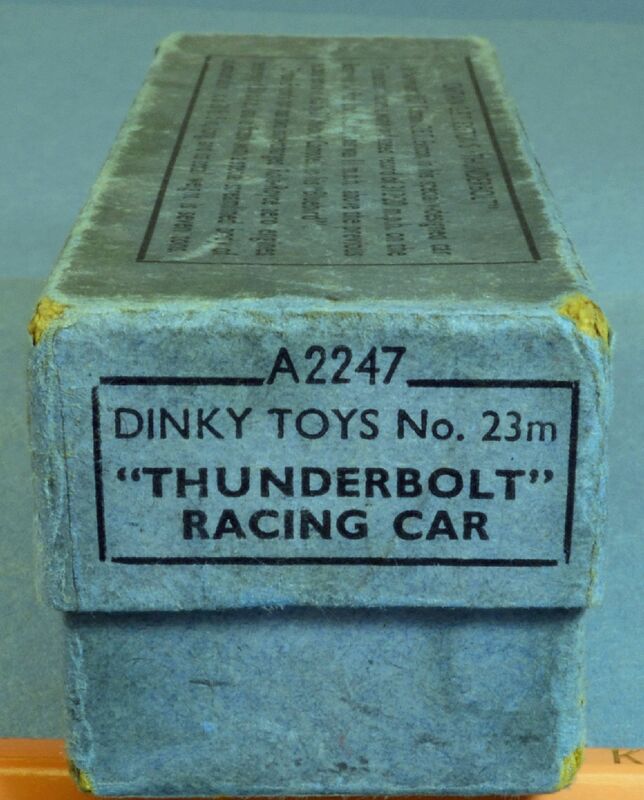 The Dinky Toys name was also changed from Thunderbolt to Streamlined Racing Car and the car re-numbered 23s in 1939. 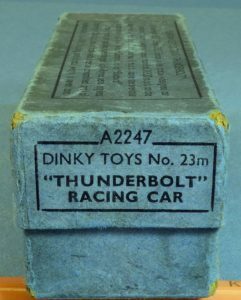 They may have done this because the record was already two years old or perhaps because it wasn’t the record holder anymore, so Dinky chose to make it “generic” in name. It was painted either green or blue, with no Union Jack. 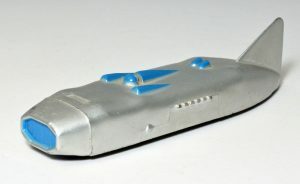 After WWII, Dinky decided to re-issue 23s, and at that time they also painted it in silver, with blue, red, or green trim, like the one shown in blue above. When they changed their numbering scheme, it was renumbered again as 222 and lasted until 1957. The early pre-war version also came in a nice box, with a nice description of the real car and its accomplishments. Here is a closeup of the box end. All text and photographs copyright of the author. Dinky Toys were introduced around 1933-1934, by Meccano Ltd., at that time a very well-known English toymaker, based in Liverpool. At first, there were just a few models, of trucks, cars, and farm tractor. 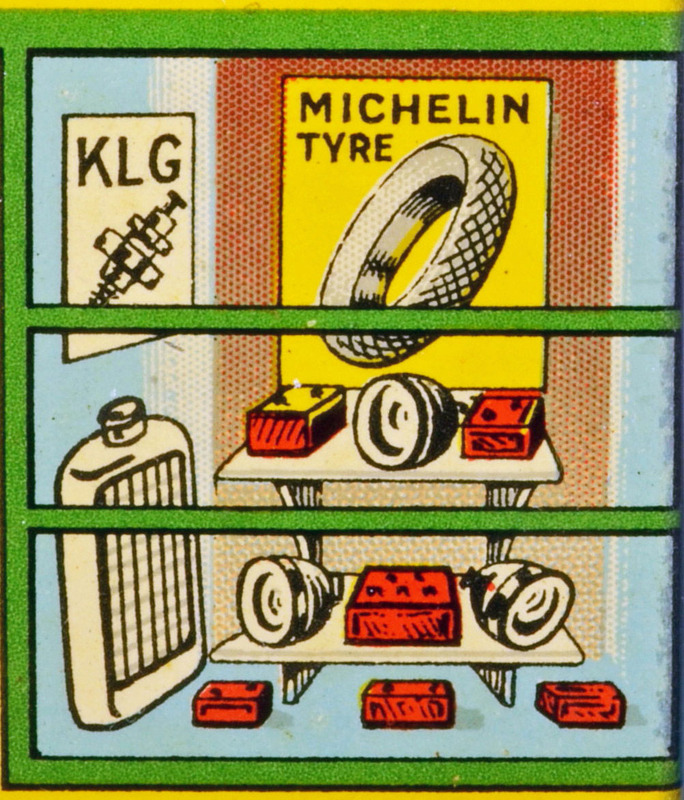 But public interest soon caught on, and by 1937, there were over 200 models in the range. 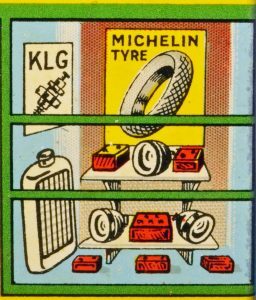 In 1935, Meccano decided to diversify the Dinky range a bit, with some simple structures that would add to play value, and hopefully sell more toys too. 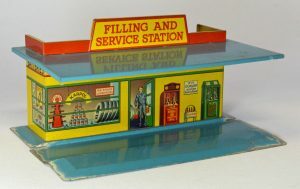 Since everything up until then was diecast, this meant using tinplate construction. 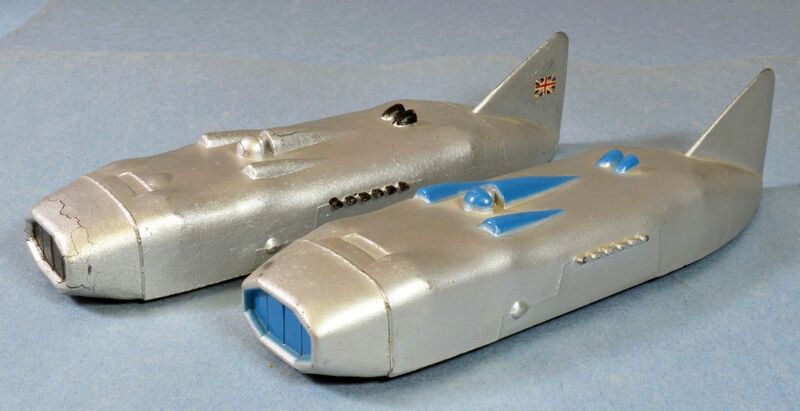 Tinplate had already been around for many years, with other toy makers even making simple models out of it… it was much easier than having precision dies made. There were two tinplate items that were featured as Dinky Toys: the #45 Garage, and the #48 Filling and Service Station. Meccano also made two other small hut like structures that were much smaller, that won’t be discussed here. late 1935. Both of these were only made during this pre-war period, from 1935-1941. The big limousine pictured with the garage is the Dinky Toys 30 series Daimler Saloon, an early post-war example with pre-war style, open baseplate, smooth wheels, and white tires – all pre-war carryovers..
re-issued, some for several more years. Others, such as these two items, were never produced again, so they were only made for a few years, and finding examples today is not easy nor inexpensive. 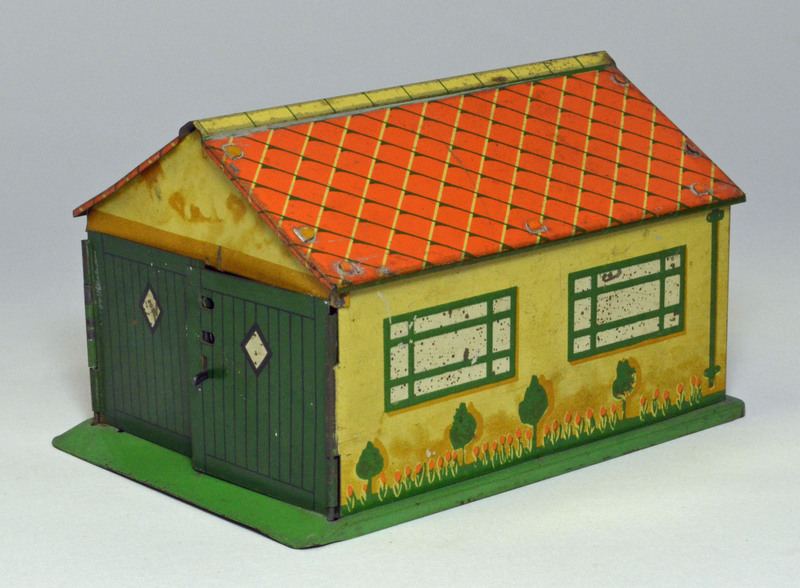 The Garage was only made in one color scheme: cream, with green opening doors, and an orange roof. 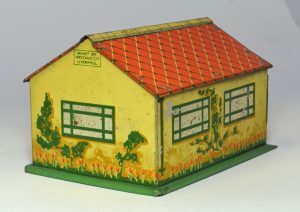 It does feature splendid lithographed details, with windows and plants adorning the sides and rear. As mentioned, the two doors do open, and have a type of latch to secure them. There is room enough to squeeze two cars inside. The Filling and Service Station is more elaborate and larger in size. It was finished with yellow walls, green or blue base, and brown or yellow roof. 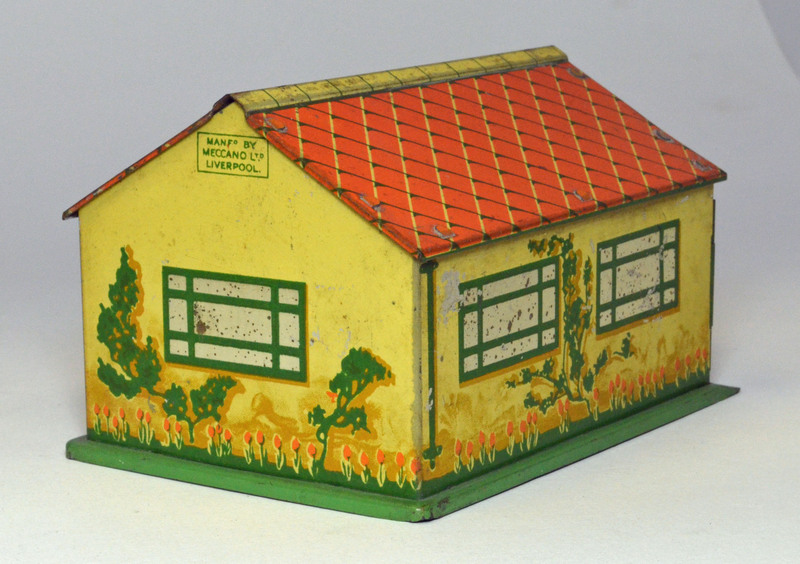 It features detailed scenes on both sides and the front… looking through the windows to see the goods stocked inside. The front even features a young man heading outside. 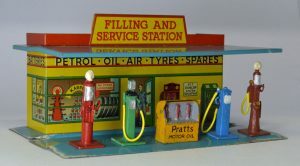 A natural accompaniment for the Filling and Service Station was a set of gas or petrol pumps, so the Dinky Toys #49 Petrol Pumps were created at the same time. They were not included with the station but could be purchased separately. To complete the scene, here is a Dinky Toys pulling up to be serviced! I have included these in the photos, as they certainly add a lot to the scene. Both of these would have been wonderful toys for young boys, who likely already had several Dinky Toys automobiles. To me, they also represent a long ago era, where the simple charm of these lithographed scenes remains today. All text and photographs copyright of the Author, unless otherwise noted. 1959 was a momentous year for me, in my early days of collecting Dinky Toys. I was 14 and totally hooked on buying every new one I could afford, so I managed to acquire quite a few that year. 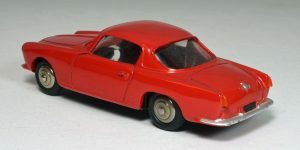 One of my favorites has always been the French produced 24j Alfa Romeo 1900 Super Sport. 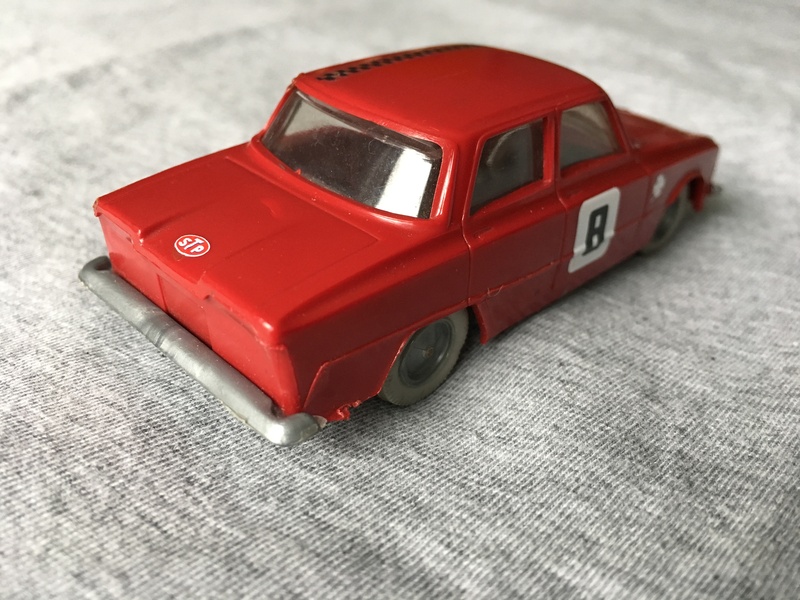 A superb diecast model, nicely painted in the proper red for this car. Dinky renumbered their models later on so this one became 527, and at some point came also in blue before being cancelled in 1963. One more photo with its box… amazingly, after almost 60 years, the original box is practically like new and still crisp. The French factory shared the molds, so English Dinky also produced this Alfa as number 185 from 1961-63. This version came in yellow with a red interior (or red with white interior). Both factories made this great 1900 for just a short time, which is a bit strange because many Dinkys in the 1960’s were made for years and years!